California's North Coast is not the only place in America where good Cabernets and "Bordeaux-styled" blends are being produced. Washington State now has an impressive track record that's developed over the past 15 to 20 years. We wanted to have a look at some of the currently-available bottlings. 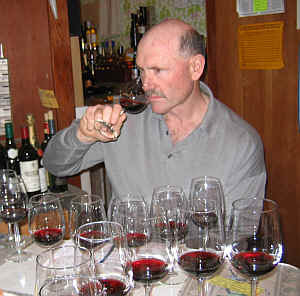 This flight featured 4 wines labeled as "Cabernet Sauvignon" and four "Bordeaux Blends". 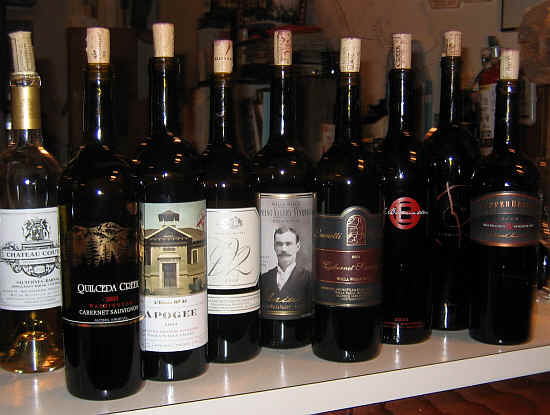 One of the wines was the famous, much sought-after 2003 Cabernet from Quilceda Creek. This wine received high numerical scores from point-collecting eno-scribes, including a 100 point rating from Pierre Rovani in The Wine Advocate. 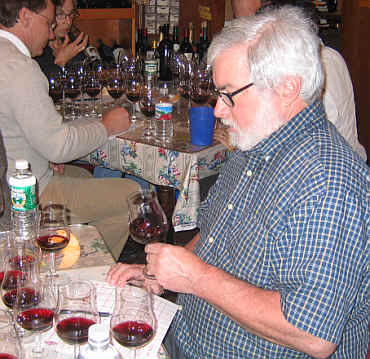 Steve Tanzer gave it 93 to 96 points and the Wine Spectator's Harvey Steiman pegged it as a 95 point bottle. Well, our "benchmark," reference point bottling finished in last place when the votes were tallied up! Actually, the statistics of point distribution in this tasting are interesting since the overall quality was in the good to very good range. So, for example, the group's first place wine had 3 first place votes, but no seconds. The second place wine, though, had two firsts and 4 seconds, but two lasts! Our 7th place wine had 2 firsts and 2 seconds, but 4 lasts!!! And the last place wine had no firsts or seconds and only one last place vote. The first place wine was only 8 points ahead of the 4th place wine. And the last place wine was 9 points out of 5th place! That's further evidence that the overall quality of the wines was similar. The stats show, basically, that the wines were actually pretty close in terms of overall quality. And, of course, it's interesting that nobody ranked the Quilceda Creek as their top choice, despite it having so many glowing reviews from various critical journals. Draw your own conclusions. One critic told us "I liked it, but there was a bothersome, off note here." Someone else found this highly-touted wine to be "Ripe and briary, with toasted vanilla notes along with oak and leathery tones. It's also a bit grapey and rather bitter." Bob Gorman found "a bit of wet stones, but it's rather un-evolved, so it's difficult to really evaluate at this stage. I dunno!" Other voices mentioned this being "more like a Merlot" and "big." Showing medium+ ruby color, I found floral notes in this wine which marked it as the "Margaux alongside a bunch of St. Juliens and Pauillacs," if you're sensitive to these subtly different fragrances. You might detect hints of violets on the nose. Medium-bodied, the Quilceda Creek Cabernet tastes of dark and ripe, sweet fruit. The floral tone comes through on the palate, confirming the notes I found on the nose. I felt this was a far less astringent rendition of Quilceda Creek. Frequently their Cabernets have been very astringent and this wine shows better balance. I'd give it 5-10 years, less than the "experts" have suggested in their evaluation of this wine. One star on my three star scale, no stars being an average or standard quality wine. One critic said "I didn't find much here. It's a simple wine, with a sharp finish and it's hot. I didn't like it." Another panel member found it has "rather abrasive tannins." A third person described this as "acidic and hollow with a medium-short finish." A final critic said "It's dull on the nose, with a bit of sweet oak. The Cabernet fruit takes a while to blossom. This may simply need time to evolve." Medium-light ruby red in color, this shows a ripe aspect to the fruit and hints of cocoa powder fragrances. There's also a light bit of oak to the bouquet. Dry and medium-full on the palate, there's a nice bit of dark fruit flavors reminiscent of blackcurrants. A hint of anise adds a spice note to go with some nice wood. Five to eight years of cellaring potential...one star. 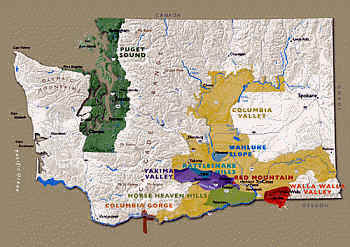 6th Place: SPRING VALLEY 2004 Walla Walla Valley "URIAH"
"Here's a fairly simple wine, as this offers cherry and berry fruit." said one critic. Another echoed this sentiment, finding "cherry jujube notes, some cocoa and a dusty tone. The tannins are 'easy' and it's a short-term wine." Someone else described finding notes of "hot chocolate," while a fourth critic encountered "earthy and mushroomy elements." Another person found notes of "black licorice," while someone else asked if this didn't have "other varieties than Cabernet. It's almost over-ripe and sweet and not especially reminiscent of Cabernet Sauvignon." Showing a medium intensity to its ruby color, this blossomed nicely in the glass, showing oak and dark fruit elements. I found hints of berries and plums with a dusty tone and a note of vanilla beans. The flavors confirmed the nose, showing dark fruit, a dusty elements and a hint of plummy fruit. I liked the structure, too, finding perhaps 5 to 10 years of cellaring potential. One-and-a-half stars on my score sheet. 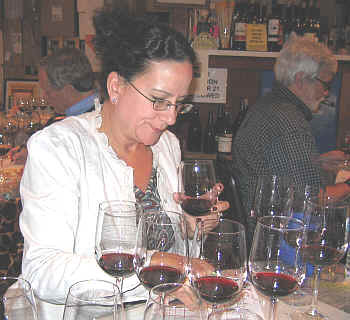 5th Place: DELILLE 2004 Columbia Valley "D-2"
"I found a sweeter profile to this wine," said one critic. "It's not mainly Cabernet, though. Clean, fruity and nice mouthfeel. It faded a bit, though." Another taster described this 'second' wine from DeLille as "tight and compact nose, with currant fruit and it's light and simple, with a soft finish. It's a rather simple wine." 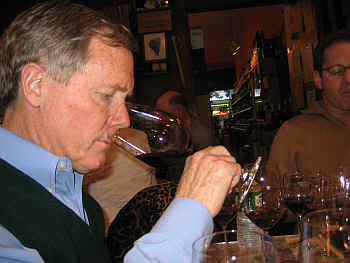 A third taster mentioned "It's the hottest wine of the tasting." Medium-light ruby in color, I found aromas reminiscent of berries and 'sweet' notes of red fruits. As it sat, a mild tea-like note emerged. Medium-bodied, the flavors showed dark fruit elements and it's a bit structured and tannic. Good berry flavors, though. It might last nicely for 5 to 10 years. One star. One taster found this to show "Lovely, sweet oak and it's elegant and very pretty." A detractor felt it was "way too sweet, so I ranked it down." Another taster said "It's got a perfumy nose...a great nose, actually," while someone else found "dusty notes and cassis-like fruit with nice oak. 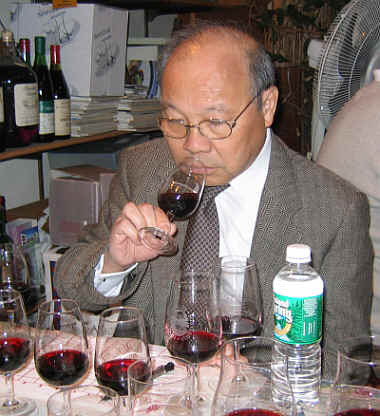 On the palate, the tannins are more serious." 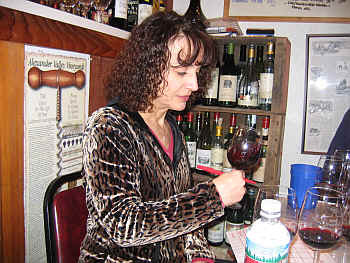 One person felt the tannins out-weighed the fruit and another critic said the wine needed more depth and complexity. Medium+ ruby color, I found a wonderful fragrance of dark fruit with black plum notes and lots of cassis. Yes, there's nice oak here, as has been the signature style of Leonetti, but it's far less pronounced than some earlier vintages. I described the wine as more cedary and woodsy than overtly "oaky." Medium-full to full-bodied on the palate, the wine had deep, dark, plummy fruit and moderate tannins. I liked this quite a bit...nice balance of fruit and tannin for my tastes. Five to ten years of cellaring potential. Two+ stars, maybe two-and-a-half. "I found a minty character here, with some tobacco-like overtones. It's medium-full on the palate and has minty flavors, with black fruit notes. Harmonious and balanced, there's a bit of tannin. Nice!" said one fan. Another taster described this as "Big, rich and ripe with dark berry fruit. It was a bit stinky to start, but the funky aromas blew off." Bob Gorman characterized this as "Queer, as though there was a plasticine, medicinal odor. The Cabernet finally emerges, though and it has nice length on the palate." Someone else described this as "Bordeaux-like," and another taster echoed this sentiment, adding "It's reminiscent of some big, Northern Medoc wines. A hint of a barnyard note did not detract from my enjoyment of this wine." Having a deep ruby color, I did not find any off notes on the nose of the Bookwalter wine. This wine really blossomed handsomely over the course of the tasting. It showed nice berry fruit to start and then a mildly cedary element came in afterwards, with a touch of anise. I liked the texture of the wine on the palate. Nice, dark fruit flavors with berries and a woodsy, cedary quality. Good balance between fruit and tannin and nice length propelled this towards the top on my score sheet. Two stars. 2nd Place: PIROUETTE 2003 Columbia Valley "Red Wine"
This wine comes from the Long Shadows Vintners portfolio, being a wine produced by Augustin Huneeus Senior (former Concha y Toro, Franciscan, Quintessa, etc. wine guy) and Philippe Melka (Bryant, Hundred Acre, Seavey, Lail, etc., wine consultant). "It's toasty, smoky, full, lots of glycerine and plenty of black fruits." said one critic, adding "It's tannic but the fruit overwhelms the tannin. It's got nice roasted meat flavors along with some chocolate and vanilla." Someone else described this as having "mint on the nose and chocolate mint on the palate." A third panel member found "leathery and resiny notes." A final taster mentioned finding "...a nice nose, concentrated blackberry, some oak, coffee grounds and lots of 'stuff' here." I was not at all attracted to this wine. It has deep ruby color, with smoky, leesy, sulphur stick, burnt match, leesy, yeasty notes which were off-putting. Poured in a black glass, I might guess this as a leesy, much-stirred-on-the-spent-yeast Chardonnay from Burgundy! The flavors are more cohesive and it tastes better than it smells. Dark fruit and woodsy notes, though I still detected some of that sulfury, yeasty tone. No stars from me, though others enjoyed this wine! "Sweet, candied fruit nose with a hint of minerality," said one critic, adding "It's got a big, long finish and nice structure." A second critic found it "ripe and plummy," while someone else found "Roasted or grilled meats." 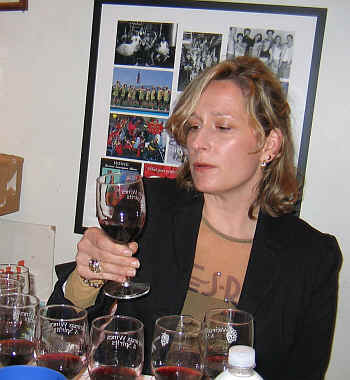 One panel member found "A soft and ripe wine, with a molasses-like edge. It's tasty, but the fruit falters." A final voice mentioned finding "licorice and lots of fruit, ripe currants and some notes of sweet chocolate." My 7th place wine, I found a medium-deep ruby color to the Pepperbridge wine. There's a woodsy note here with lots of dark fruit; definitely Cabernet-based with some charred wood tones. I was slightly bothered by a smoky tone, bordering on a yeasty, sulfury element on the nose. It's a slightly charry-flavored red wine, soft and easy on the palate. I didn't find this to have much cellaring potential as it's quite ready to drink presently in my view. Perhaps a half star rating.